The first Guerilla Heart weekend near Scarborough was a resounding success. Deep motion on the dance floor and an unforgettable party. The March blizzards prevented quite a few dancers from getting here so let's do it again! This time based in the beautiful meadow at Hay Brow campsite with a party under the stars. Hay Brow has been the base for some of my deepest work, a field for our sole use cradled in a crucible of woods and hills. Close enough to the sea for an early morning swim, near enough to Scarborough to make it easy by public transport. 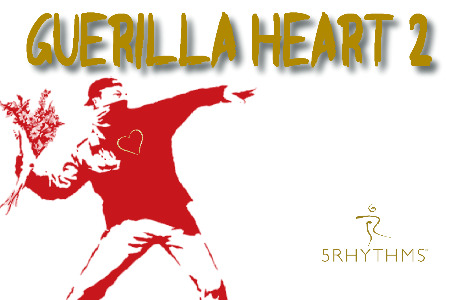 Guerilla Rhythms is a particularly magical way of exploring the 5Rhythms maps. I promise to prepare nothing in advance. Without a theme or a specific intention we can arrive in movement landscapes that we might never have discovered in a planned workshop. Discoveries at Guerilla Rhythms have inspired entirely new workshops and fields of exploration. There will be marquees, showers, a kitchen tent and a fire on site. The event is, in part, a fundraiser for my Heartbeat Teacher training. I've now completed the training but I'm still in a rather costly dance with Barclaycard so your generosity is doubly welcome!